​Setting the new standard for static welfare units, we bring outstanding accommodation, comfort, and storage together for a team of 11. The perfect welfare solutionDesigned to be compact, lightweight and easy to use, it’s suitable for almost any environment. 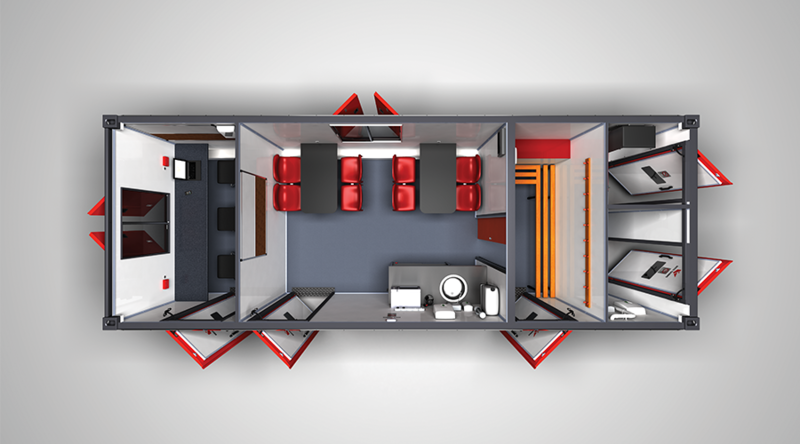 Our Canteen & Office Space welfare cabin provides seating for up to eleven people, in comfort. It has plenty of dedicated storage, as well as individual personal storage compartments. Seating to accommodate 8, dedicated wall storage compartments, 2kw ceiling mounted heater, catering grade stainless steel worktops, microwave, forearm sink with hot-wash, towel and soap dispensers, window with security shutter.